Are You an Over Carer? over care for are seldom grateful, and take full advantage of our generous nature. Please examine your relationships and determine if they are meeting your needs. Yes, despite what we’ve told ourselves, we mater and deserve reciprocative relationships. 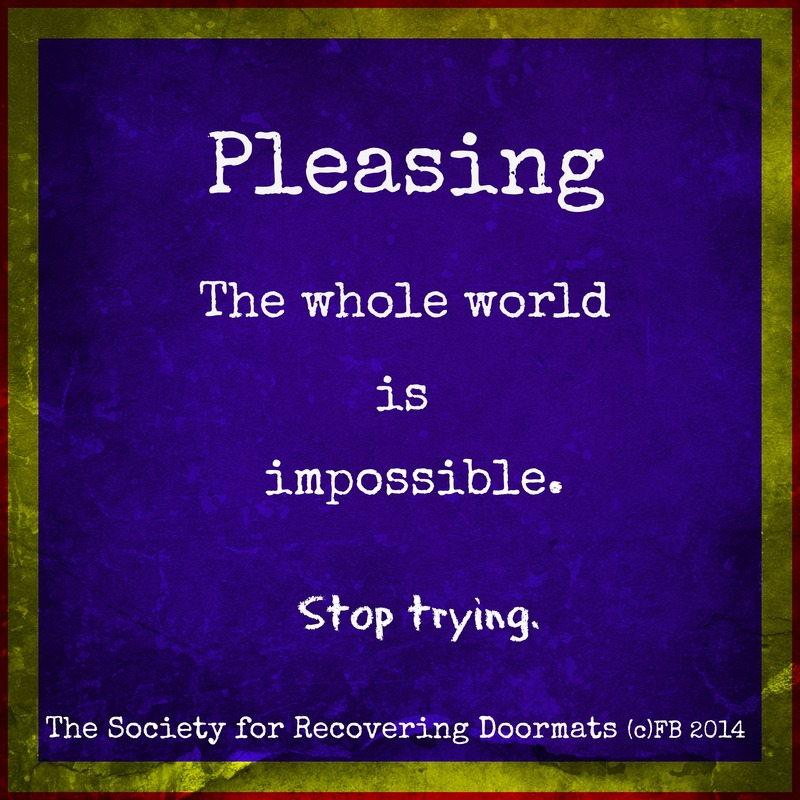 Please yourself, because pleasing the whole world is unhealthy, exhausting and impossible. End of story. I am not a people pleaser but my husband is and it has caused us so many problems that we have now separated. I love my husband with all of my heart but have lost so much respect for him. I only finally figured out that he was a people pleaser recently and now it is too late. It is our second marriage each and unfortunately my husband felt the need to please his ex wife and adult children so much that he would trample over the top of our relationship and my needs to satisfy them. It only serves to make me feel insecure in our relationship and that he did not prioritise our marriage over any other relationship. His ex wife muddled in our relationship and his children were disrespectful but he could never stand up to them. After years of this I retaliated and got very angry and mean. Obviously this pushes the people pleaser away. My husband was full of resentment towards me for making the situation worse and started contacting another woman to complain about my behavior. He lied to me about this and he has lied to me about so many things now there is no trust in our relationship. He says he is working on becoming more assertive but as we are separated now I have no way of knowing. The problem with being married to a people pleaser is they take it for granted that you love them and spend all their time ingratiating themselves to other people who don’t have any respect for your spouse anyway. Oh Katie, I am so sorry you are struggling with this. Thank you for sharing . Sending you many hugs and much love during this difficult time. Perhaps with counseling you could work it out with your spouse. I am not a mental health professional, so I can’t offer professional advice. But, I think a trained therapist for you and your husband may improve your lives. If he isn’t on board with this, YOU go. By yourself and sort things out. Thank you. We have previously been seeing a therapist and my husband admits he has some issues. I have also been to the therapist on my own. After a monumental blowup about a week ago we met for coffee last night. We didn’t bring up any issues but just enjoyed each other’s company. I hope beyond hope that we can reconcile but have reached a level of acceptance now that what will be, will be. Maybe my story serves to highlight how people pleasing behaviour can hurt the ones who love you the most. When a spouse is a people pleaser to adult family members, they are just using him, yet the hunger for their love and acceptance is like a carrot in front of a horse. Of course, the adult family members are usually sociopaths and completely incapable of real love. A problem that has improved over the years in our marriage, but my husband is still soft-hearted to these users. Most kind hearted people run the risk of being too nice to everyone. Even to sociopaths. That is why it is important to be aware and diligent about people pleasing behavior. It takes a long time to learn who deserves your attention and who doesn’t. Sometimes it is a self esteem issue. All I can say, as a lay person, NOT a therapist , just a recovering doormat: continue encouraging your husband to open his eyes and see people for who they are. Just because they’re family doesn’t give them special privileges to treat you disrespectfully and take advantage. Sometimes a good hearted person needs a wake up call from someone who loves them and point out their matty ways.